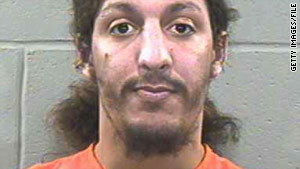 Richard Reid pleaded guilty to terrorism charges in October 2002 and is serving a life sentence in Florence, Colorado. (CNN) -- The attempted attack on a Northwest Airlines flight Friday fell almost to the day eight years after another failed solo attack on an international flight. Two months after 19 jihadists hijacked airplanes and flew them into the World Trade Centers, the Pentagon and a Pennsylvania field, Richard Reid attempted to detonate explosives hidden in his sneakers on an American Airlines flight from Paris, France, to Miami, Florida. Passengers thwarted his plan, and the plane landed safely in Boston, Massachusetts. Reid pleaded guilty to terrorism charges in October 2002 and is serving a life sentence at the nation's super-maximum security prison in Florence, Colorado. American Airlines Flight 63, carrying 197 people from Paris to Miami was diverted to Boston on December 22, 2001, after passengers and crew saw Reid trying to light a fuse and subdued him by tying him to his seat. A doctor on board administered a tranquilizer. FBI bomb technicians and explosives experts found explosives in Reid's shoes. Reid, a British citizen and convert to Islam, pleaded guilty to all eight counts against him -- including attempted use of a weapon of mass destruction, attempted homicide and placing an explosive device on an aircraft. "At the end of the day, I know I did the actions," Reid said when entering his plea. "Basically I got on a plane with a bomb. Basically I tried to ignite it." Previously, Reid had called himself a disciple of al Qaeda leader Osama bin Laden and an enemy of the United States. He also said he did not recognize the U.S. legal system. Zacarias Moussaoui, the only person convicted in the United States for his role in the September 11, 2001, terror attacks, said during his 2006 sentencing trial that he and Reid were supposed to be part of the attacks on U.S. targets. But Reid testified via a statement that although he knew Moussaoui, he knew nothing about the 2001 attacks, which killed nearly 3,000 people, and was not to be part of them. The day before Reid went on his solo mission, he wrote a letter to his mother bequeathing his belongings to Moussaoui, casting further doubt on Moussaoui's claim that they later intended to die together in what court documents called a "martyrdom operation." Moussaoui was arrested in August 2001 in Minnesota after instructors at the flight school he was attending reported he was acting suspiciously and did not have much flying experience. Throughout his legal proceedings he repeatedly changed his story. He pleaded guilty to terrorism conspiracy and is also serving a life sentence in the Colorado prison.